Healthy food recipes for kids is a must in today's fast-food and over-processed world. You want your children to get the best nutrition possible, especially during their formative years, but how can you get a picky eater to consume enough fruits and vegetables as well as whole grains? If your children are like mine, you probably find yourself caving in far too often and serving white bread, pasta, hot dogs and pizza. The problem is these foods lack the crucial nutrition your children need. American children today tend to be overfed but also undernourished - so much so they are more prone to illness, take longer to recover when they do get sick and have attention deficit and other behavior disorders. Unfortunately, if left to their own, children won't pick the foods they need to eat, but instead choose foods that taste good and are likely loaded with chemicals and preservatives. You and I know that whole grain bagel is much better than the white one, but our children won't. So how can we get our children to try healthy food recipes for kids that have "yucky" ingredients like spinach, cauliflower and broccoli? 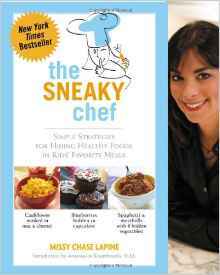 Enter Missy Chase Lapine, author of The Sneaky Chef: Simple Strategies for Hiding Healthy Foods in Kids' Favorite Meals. You make a puree of all the "yucky" stuff, such as cauliflower, fresh spinach and other healthy ingredients and then add that puree to other ingredients. That way you can sneak in otherwise taboo vegetables such as cauliflower and zucchini into macaroni and cheese and burritos. With a puree, your children will never even know, let alone taste, the healthy vegetables their bodies need. As author Lapine points out, there are a lot of things we don't explain to our children, simply because they wouldn't understand. You know your child needs exercise, but you wouldn't put little Billy on a treadmill and tell him he needs exercise to stay healthy. Instead, you would encourage him to play tag. In the same way, making those vegetables into a fun recipe will encourage your children to eat better. And, with all that added nutrition in your child's diet, he is less likely to get sick, become obese and develop diabetes later on in life, saving you costly medical bills. So let's get started. You can always teach him about nutrition later on. These healthy food recipes for kids involve making purees ahead of time, and then freezing them for later use. In addition, to the white puree, Lapine has recipes for a purple puree, orange puree, and green puree. Here is the recipe for the white puree. Steam the cauliflower for 10 to 12 minutes. In the meanwhile place the raw zucchini with the lemon juice in a food processor or blender and pulse. Drain the cooked cauliflower and add it to the pulsed zucchini and lemon. Add two tablespoons of water. Puree until smooth, adding the extra water only if necessary. This makes 2 cups of puree. Freeze in 1/4 cup portions in a freezer bag for later use in healthy food recipes for kids such as these two that follow. The next time your kids demand macaroni and cheese, give them this healthy version. Cook the macaroni until it is slightly undercooked. Drain and put half of the macaroni in a greased, 9-inch square baking dish. Cover with half the grated cheese. Layer with the rest of the macaroni. Meanwhile whisk the milk with the white puree, salt and eggs if you plan on adding them. Pour the milk mixture over the macaroni and top with the remaining cheese. Bake at 375 degrees Fahrenheit for 30 to 35 minutes until golden and bubbling. Avoid that fast-food burrito. Try this far healthier version instead. 1/2 cup canned, low-fat refried beans or the homemade version. Combine the refried beans and white puree in a saucepan and warm through over low heat on the stovetop. Warm the tortillas in a dry skillet or microwave them. Spoon about 2 tablespoons of the bean mixture onto the bottom third of each tortilla and top with 1 to 2 tablespoons cheese and any other toppings you prefer, such as tomatoes or salsa. Fold the end of the tortillas closest to you over the filling ingredients and then fold the right end over next and roll up.